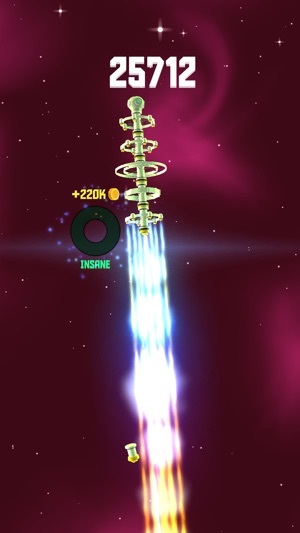 Space Frontier 2 is the sequel to the insanely popular Space Frontier, a game that rose to the stratosphere with 25+ Million downloads. We listened to your feedback and came up with something beyond imaginable! Weekly Elite Membership offers a weekly subscription, you will have a 3-days FREE trial period, after this period you will be charged $7,99. 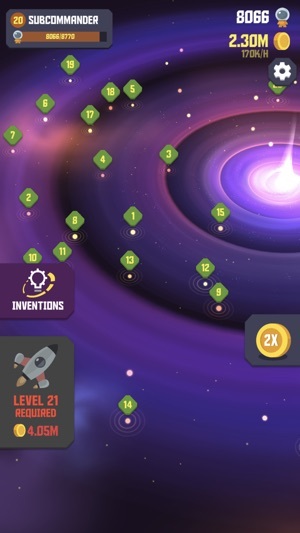 After buying this subscription, you will unlock an exclusive TISLA Spaceship Capsule, 20 astronauts on each launch, Double Coins on everything and Remove Ads. This is an Auto-renewable subscription. The payment is charged to your account after confirmation. The subscription is renewed unless you turn it off 24 hours before the period ends. Your account will be charged for renewal as well. • The user may manage the subscription and auto-renewal have to be turned off by going to the user’s account settings after purchase. Ad free not so ad free. I think its a cute app honestly, i love these kind of games and its art style is great. Its just the ads that gets to me.. after first downloading the app the ads were so annoying after every launch i broke down and just bought it for $2.99. (which is kinda asking a lot for an already free game.) yet after that purchase ads are still relevant to the game. I mean.. don't advertise “ad free.” If you aren't going to completely get rid of the ads. Its worse enough that the game keeps advertising its “elite membership for $7.99 a month deal” every few launches of your spaceship (that still feels like an ad to me and every time it appears the game glitches and I'm stuck in a screen i cant get out of.) 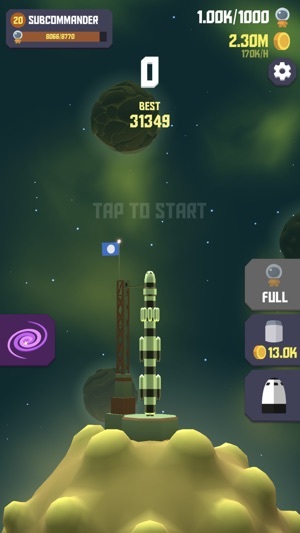 I get that the ads aren't as forced after purchase, it at least becomes my choice to click them if i want more astronauts or ship aesthetics but come on its a bit ridiculous, the game just goes by slower if you don't. anyone else wanting to get the game ads free i recommend just deleting it and finding something else, its not worth it. I haven't seen an ad trap this bad in an app before and they still have the audacity to ask for more money. 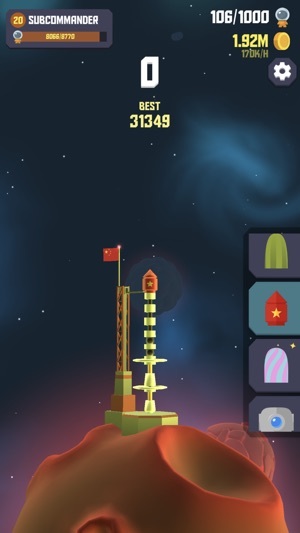 At least give the players something like more spaceship aesthetics for buying the app. Fun game but it’ll make you feel like an abused house wife that keeps coming back to her gorgeous husband that wont shut the hell up about other husbands in the area.. but for $7.99 a month he’ll do the dishes!! I really like this game, it’s great for a quick session or for continuous grinding. That being said, there are a few bugs that have basically made me quit playing. 1- Paying for premium and cancelling it immediately should give you 1 week, but instead it gives you 3 days. I fell for this twice. 2- Watching an ad to double your money is cool when it actually works, but if you’ve been out of the game for too long you’ll get a notification upon opening the game that says “do you want to know when you’ve made a lot of money?” and are just given the gold that you earned offline without the option to double it. Another bug with this is if you open the app and get a phone call or text or literally anything that removes the game from focus, you’re given the gold and the offline accumulation resets without being able to watch an ad to double the big amount. To start off, this is a free title. So ads are expected to be a thing the developers need a way to make a profit and that’s fine. But in my experience with free games with ads the frequency is pretty low. Literally the first ten seconds of opening the app I was given an ad, and then again 10 seconds later. The ads are fine, but lengthen the frequency between them and well be right as rain. The gameplay in this is addicting, but gets very boring very fast. While I enjoyed it for the first ten minutes the game offers little to no variety in its gameplay, you tap the screen and it happens. And while it was a little bit fun work needs to be done. 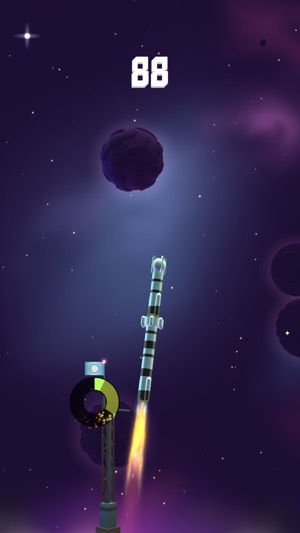 This game is not well optimized for people with older iPhones. I play on an iPhone 6s, and even a friend of mine who plays on an. iPhone 8 was having trouble with lag. However a friend of mine who plays on the iPhone X of course had little to no trouble at all, just some hiccups when the ads appeared. This is probably the worst part, if you don’t own an iPhone X don’t even bother trying to play this game it is slow, laggy and while very pretty, not a good experience.